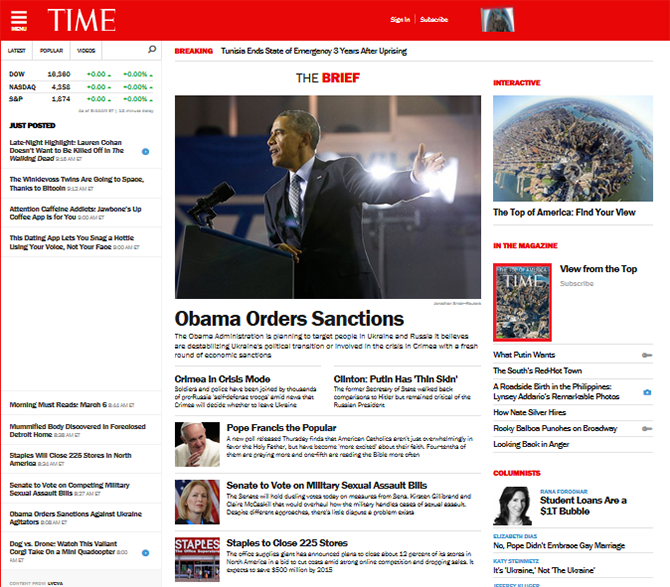 Time.com decided to develop a website redesign back in September and that it was going to be a four or five step of a longer process, such as mobile and video. As far as news homepages go, its not over the top, its consider a cleaner version then the current one that had previously. Another feature is the relaunch of its sponsors such as Citi, Siemens, and Advil, as well as new ad units. Any banner ad can now be magnetized, meaning it can be zoomed out as the user hovers over the ad to entice the user to click the advertisement. One of the biggest elements is the use of the responsive design, so elements will shift to accommodate the smaller screens of tablets and smartphones, so the experience is customized for the platform. Time says the website saw 23 million unique visitors in January, an increase of 118 percent year-over-year. And mobile now accounts for 45 percent of its traffic due the the website redesign efforts.